Return once again to the enduring account of life in the Mojo lane, to the Permian Panthers of Odessa -- the winningest high school football team in Texas history. Odessa is not known to be a town big on dreams, but the Panthers help keep the hopes and dreams of this small, dusty town going. Socially and racially divided, its fragile economy follows the treacherous boom-bust path of the oil business.In bad times, the unemployment rate barrels out of control; in good times, its murder rate skyrockets. But every Friday night from September to December, when the Permian High School Panthers play football, this West Texas town becomes a place where dreams can come true. 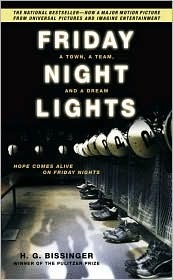 With frankness and compassion, Bissinger chronicles one of the Panthers' dramatic seasons and shows how single-minded devotion to the team shapes the community and inspires-and sometimes shatters-the teenagers who wear the Panthers' uniforms. Includes Reader's Group Guide inside. Now a major motion picture starring Billy Bob Thorton.